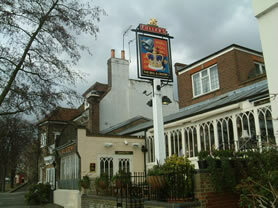 The Bell & Crown on Strand on the Green's reopened this week after an extensive refurbishment. The mark the event, children from Strand on the Green Primary School have been making hats representing bells and crowns. Manager Gerardine McBrearty said "The Bell & Crown is a real family pub, and a number of the children's parents are among our regular customers. I thought it would be nice to involve the local community in celebrating our refurbishment, so I put the idea to the local school." 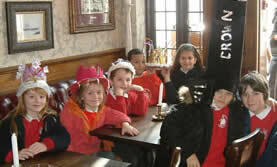 The winning children in Years 3 and 4 each received a £10 book token and the winners for Years 5 and 6 will receive a £20 book token, which they collected from Gerardine as the pub reopened its doors on Wednesday 8th February. The Bell & Crown's refurbishment has seen the pub redecorated inside and out and includes new furniture, carpet and a new gold leaf gilded pub sign to welcome customers. Gerardine, who has run the pub with her husband Frank for the past seven years said "I've always been very proud of the Bell & Crown, and now it looks better than ever. If only it was so easy to make my husband Frank look this good!